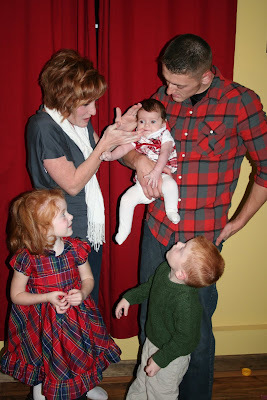 raising redheads: i am who i am. I am not timid. I am not a quiet girl. I definitely have more of an in-your-face personality; the person you want on your team in an argument and the one who will say what you're thinking without feeling guilty about it later. I realize that this doesn't sound like the submissive, meek, quiet woman that we all read about in the Word. However, I am comforted in knowing that I have really grown into this person that God created me to be. I have learned how to channel my inner voices and thoughts so that they come across much more mild than how they may sound inside of my head. I have learned to quiet my voice in situations that call for such behavior. I have prayed to be changed into a meek and quiet woman of God. And then I stopped praying that. I long to be obedient to God and His word. I long to be submissive to my husband and quiet in my actions and words. But more than anything, I desire to be who God created me to be--and to be the greatest at being that person. I know that God designed me this way for a purpose. For a great calling. And I embrace and accept that. I'm a little over the top sometimes. Some of you may think that we would get along really well in real life. You may think that we would enjoy a quiet afternoon of chatting. But I'm here to tell you that there is not a lot of quiet in this soul of mine. There is not a lot of sitting or stillness. There is chaos. Loud, emotional, opinionated, valid chaos. and I can accept that because the Lord made me. And He doesn't screw things up. I can screw it up. I can do that everyday. And many times I do. I fail with my words or my aggressive attitude. But more often than not I am able to step up when someone needs me to, make decisions quickly and without regret, give valid opinions in situations that are difficult, and take the lead when it is needed. I realize I can be intimidating. I realize I can be dominating in a conversation. I understand those things and continue to try hard to not embrace them to the point of being obnoxious. Everywhere I go, people stare. Even my red hair is over the top. But the essence of who I am--my presence, I suppose, can be overwhelming. I understand that as well and am trying to consider it when I get stares or comments. I also suppose that our family, in all of it's chaos and red hair, can be a little hard to swallow sometimes too. There is NEVER a quiet moment. There is NEVER a day when we aren't screaming, dancing, and yelling. And although it is extremely hard sometimes and exhausting almost always--I am embracing us as well. It isn't always pretty, but it's ours. Loud. Crazy. Beautiful. Saved. Delivered. Ok, i didn't thought that you are like this Ramee...but that you are like you are..maybe a bit loud or agressive or over the top makes you even more adorable.